Get A FREE Tip Sheet from Handy Copywriting When You Subscribe! 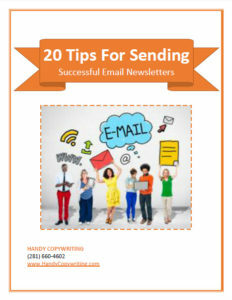 Sign up for a free, no-commitment subscription to the Handy Copywriting e-Newsletter about email newsletter marketing and get a FREE Bonus Tip Sheet. What are the best email newsletter tips for nurturing leads better AND getting a head start over the competition? How do you start, or simply manage, customer relationships more effectively so that you maintain a steady flow of leads and sales?! What steps do I take to develop a successful email newsletter for my business from the start? What steps are involved in promoting an email newsletter properly? How do I pinpoint the correct success measurements for getting good ROI with an email newsletter? ​Reports are sent as PDF files. Subscribe today, and you can be reading your reports in just a few minutes from now. Your satisfaction is guaranteed. If you ever decide my e-newsletter is not for you, you can unsubscribe at any time. The price – zero – can’t be beat. And whatever you decide, all issues and bonus reports received are yours to keep absolutely free – for The Handy Copywriting E-NewsLetter a try! Also, on the next page, you’ll receive all the information that shows you why you really can get an email newsletter for my kind of business THAT WORKS.